This document describes how to setup Protocol Independent Multicast (PIM) on Check Point Gaia OS. This document focuses on the basic configuration of PIM and does not discuss any PIM features in detail. Before starting the PIM configuration, user should be familiar with underlying features and their configurations, such as static and dynamic routing, multicast and PIM, IGMP, ClusterXL, VRRP, SAM card configuration. For more details, refer to relevant Administration Guides. On VSX Gateway / VSX Cluster Member, the configuration must be performed in the context of Virtual System / Virtual Router (vsenv <VSID>). In ClusterXL or VRRP Cluster, the routing configuration including PIM must be identical on all cluster members. Multicast is designed to enable the delivery of datagrams to a set of hosts that have been configured as members of a multicast group in various scattered subnetworks. Multicasting employs a Class D destination address format (224.0.0.0 - 239.255.255.255). Individual hosts are free to join or leave a multicast group at any time. There are no restrictions on the physical location or the number of members in a multicast group. A host may be a member of more than one multicast group at any given time and does not have to belong to a group to send messages to members of a group. Protocol-Independent Multicast (PIM) is a family of multicast routing protocols for Internet Protocol (IP) networks that provide one-to-many and many-to-many distribution of data over a LAN, WAN or the Internet. It is termed protocol-independent because PIM does not include its own topology discovery mechanism, but instead uses routing information supplied by other routing protocols. PIM Sparse Mode (PIM-SM) - Explicitly builds unidirectional shared trees rooted at a rendezvous point (RP) per group, and optionally creates shortest-path trees per source. PIM-SM generally scales fairly well for wide-area usage. 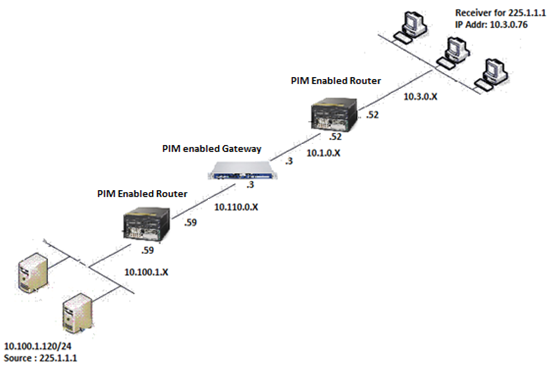 PIM Dense Mode (PIM-DM) - Uses dense multicast routing. It implicitly builds shortest-path trees by flooding multicast traffic domain wide, and then pruning back branches of the tree where no receivers are present. PIM-DM is straightforward to implement but generally has poor scaling properties. 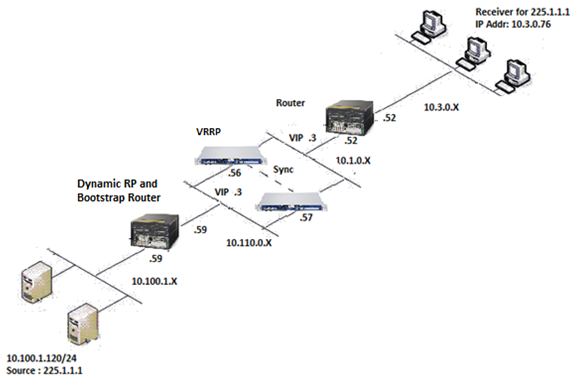 The first multicast routing protocol, DVMRP used dense-mode multicast routing. Refer to RFC 3973. Bidirectional PIM - Explicitly builds shared bi-directional trees. It never builds a shortest path tree, so may have longer end-to-end delays than PIM-SM, but scales well because it needs no source-specific state. Refer to RFC 5015. Source-Specific Multicast (PIM-SSM) - Builds trees that are rooted in just one source, offering a more secure and scalable model for a limited amount of applications (mostly broadcasting of content). In SSM, an IP datagram is transmitted by a source S to an SSM destination address G, and receivers can receive this datagram by subscribing to channel (S,G). Refer to RFC 3569. Only one mode of PIM can be enabled at a time. Senders and receivers are in close proximity to one another. There are few senders and many receivers. The volume of multicast traffic is high. The stream of multicast traffic is constant. There are few receivers in a group. Senders and receivers are separated by WAN links. The type of traffic is intermittent. Most multicast traffic is from well-known sources. SSM requires IGMPv3 to be enabled. SSM groups are 232.0.0.0/8 and do not require an Rendezvous Point. All other groups are treated as Sparse mode and require a Rendezvous Point. Rendezvous Point (RP) is essential for Sparse mode operation. Also, all routers in the network must agree on the Rendezvous Point of a group. 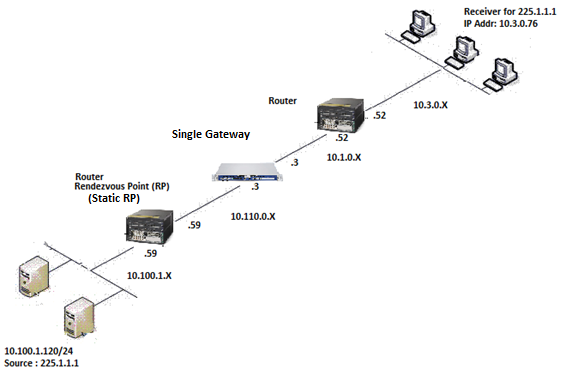 The RP facilitates multicast flows between multicast listeners and senders. When a multicast source sends traffic, the RP is notified, and when a client joins a particular groups traffic, the Rendezvous Point is notified. The Rendezvous Point builds a tree between a source and listener for multicast traffic to flow through, alleviating the flood and prune behavior of PIM Dense Mode. 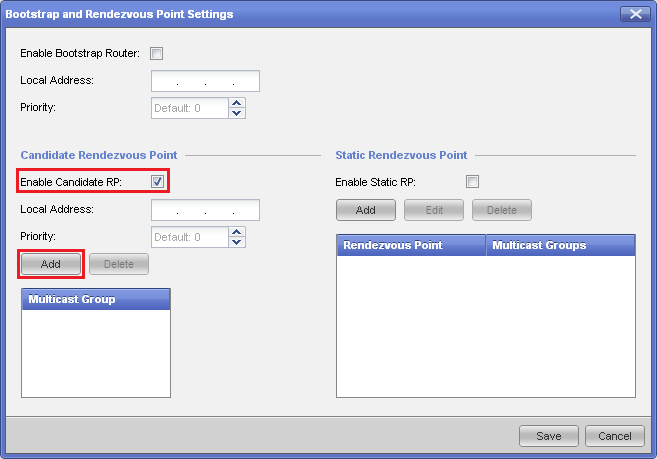 Rendezvous Point can be configured statically or dynamically. BootStrap Router (BSR) is a protocol for discovering candidate Rendezvous Points, and then advertising that information to all other routers in the network. All Candidate Rendezvous Points send their advertisements to the elected BSR. If there are multiple BSRs the one with the highest priority is elected as the BSR. Candidate BootStrap router with highest priority is elected as bootstrap Router. BootStrap router receives candidate Rendezvous Point advertisements and distributes them to the rest of the network. 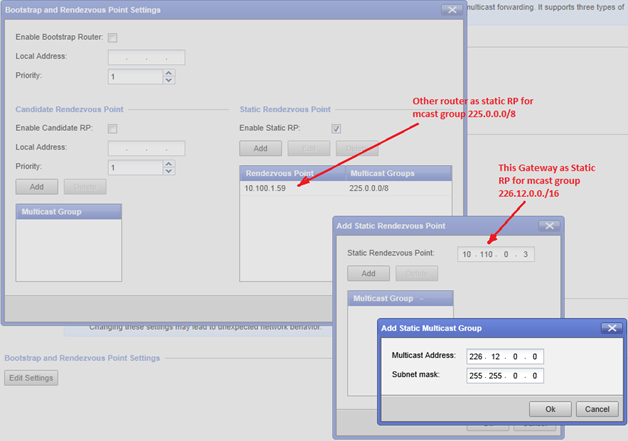 Each Candidate Rendezvous Point unicasts their Rendezvous Point Groups and Priority directly to the Bootstrap router. The Bootstrap router forwards Rendezvous Point information it receives to the rest of the network via multicast (224.0.0.13). Each individual router in the network picks the best Rendezvous Point to group mappings. For Rendezvous Point election, lowest priority wins. Candidate Rendezvous Point can advertise itself as suitable Rendezvous Point for any number of multicast addresses (default is 224.0.0.0/4). A Static Rendezvous Point is used when the network is unable to use the BSR mechanism - for example when the rest or the network is using Cisco AutoRP. Static Rendezvous Point overrides all dynamically learned info. 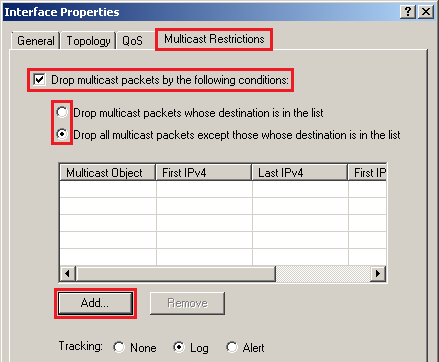 If the multicast network is small Static-RP can be configured. However, Static Rendezvous Point configuration has to be configured on all PIM routers and Security Gateways. Gateway can act as a PIM router in an environment that has some routers functioning as Candidate Rendezvous Points and Candidate Bootstrap routers. 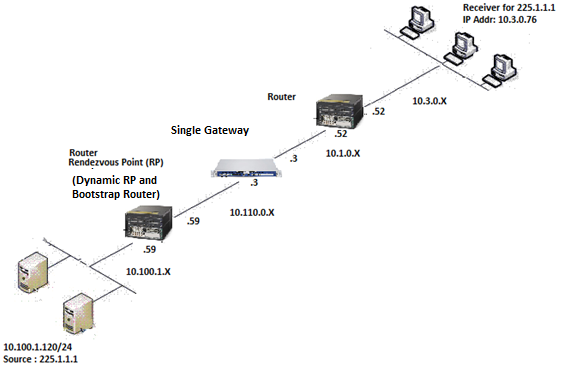 Gateway can act as a PIM router in an environment that has static Rendezvous Point(s) for multicast groups. Optionally, Gateway can also act as a Static Rendezvous Point. 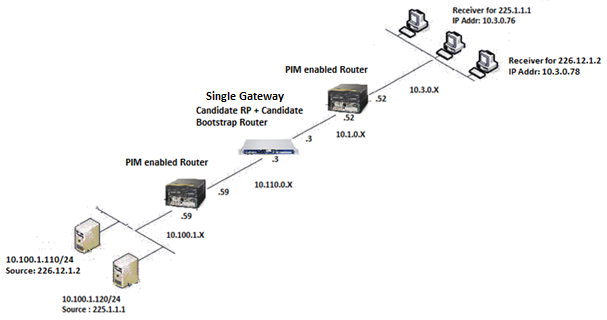 Gateway can act as a PIM router and Candidate Rendezvous Point and/or Candidate Bootstrap router in PIM environment. PIM on Gaia OS can be configured either in Gaia Portal, or in Clish. Connect to Gaia Portal on Security Gateway with web browser at https://Gaia_IP_Address. Go to 'Advanced Routing' pane. Do not configure the 'Local Address'. Do not check the box 'Use Virtual Address'. Optional: Configure a 'DR Priority', if a value other than the default is desired. The range is between 0 and 4294967295. The router with the highest DR priority is elected as Designated Router on the LAN - ties are broken in favor of the highest IP address. In the 'PIM Global Settings' section, click on 'Apply' button. Optional: Configure a DR Priority, if a value other than the default is desired. Note: Refer to the example topology above. Multicast does not require any configuration in SmartDashboard. All PIM routers and Security Gateways in Static Rendezvous Point environment should be configured with Static Rendezvous Point addresses and their multicast groups. In the 'Static Rendezvous Point' section, check the box 'Enable Static RP'. Click on 'Add' button - configure Static Rendezvous Point (enter the IP address). Optional: Add the Static Multicast Group(s), for which this Rendezvous Point is to be used. If no multicast groups are configured, the Rendezvous Point is treated as the Rendezvous Point for all multicast groups (224.0.0.0/4). Optional: Security Gateway can also be configured as Static Rendezvous Point - configure the IP address of one of the Security Gateway's PIM interfaces. Do not configure any other field in 'Bootstrap and Rendezvous Point Settings' window. Note: If no multicast groups are configured, the Rendezvous Point is treated as the Rendezvous Point for all multicast groups (224.0.0.0/4). In the 'Candidate Rendezvous Point' section, check the box 'Enable Candidate RP'. Optional: Enter the IP address of one of the PIM interfaces in the 'Local Address' field. Note: If nothing is configured, PIM automatically selects the address of one of the PIM interfaces. Optional: Configure a 'Priority', if a value other than the default is desired. The range is between 0 and 255. The Candidate Rendezvous Point with the lowest priority is preferred - ties are broken in favor of the highest IP address. Optional: Click on 'Add' button - add the Candidate Multicast Group(s), for which this Rendezvous Point is to be used. At the top, check the box 'Enable Bootstrap Router'. ClusterXL can act as a PIM router in an environment that has some routers functioning as Candidate Rendezvous Points and Candidate Bootstrap routers. ClusterXL can act as a PIM router in an environment that has static Rendezvous Point(s) for multicast groups. Optionally, ClusterXL can also act as a Static Rendezvous Point. 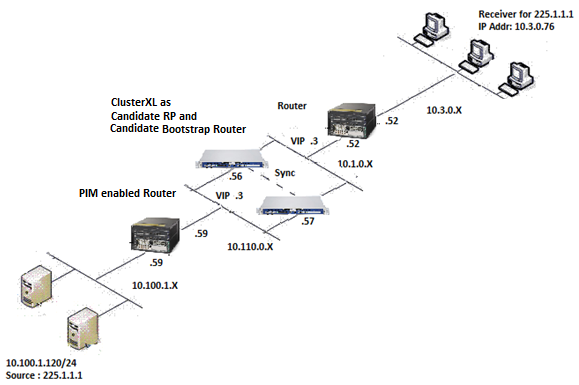 ClusterXL can act as a PIM router and Candidate Rendezvous Point and/or Candidate Bootstrap router in PIM environment. Connect to Gaia Portal on each cluster member with web browser at https://Gaia_IP_Address. Optional: ClusterXL can also be configured as Static Rendezvous Point - configure the Virtual IP address of one of the PIM interfaces. In the 'Candidate Rendezvous Point' section, check the box 'Enable Candidate Rendezvous Point'. Enter the Virtual IP address of one of the PIM interfaces in the 'Local Address' field. Important Note: Unlike in Single Security Gateway, this field is mandatory when using ClusterXL. The Candidate Bootstrap Router with the highest priority is preferred - ties are broken in favor of the highest IP address. VRRP cluster can act as a PIM router in an environment that has some routers functioning as Candidate Rendezvous Points and Candidate Bootstrap routers. VRRP cluster can act as a PIM router in an environment that has static Rendezvous Point(s) for multicast groups. Optionally, VRRP cluster can also act as a Static Rendezvous Point. 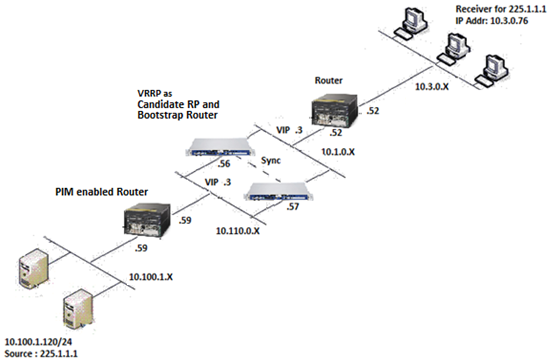 VRRP cluster can act as a PIM router and Candidate Rendezvous Point and/or Candidate Bootstrap router in PIM environment. Check the box 'Use Virtual Address'. The router with the highest DR priority is elected as Designated Router on the LAN with - ties are in favor of the highest IP address. Optional: VRRP Cluster can also be configured as Static Rendezvous Point - configure the Virtual IP address of one of the PIM interfaces. 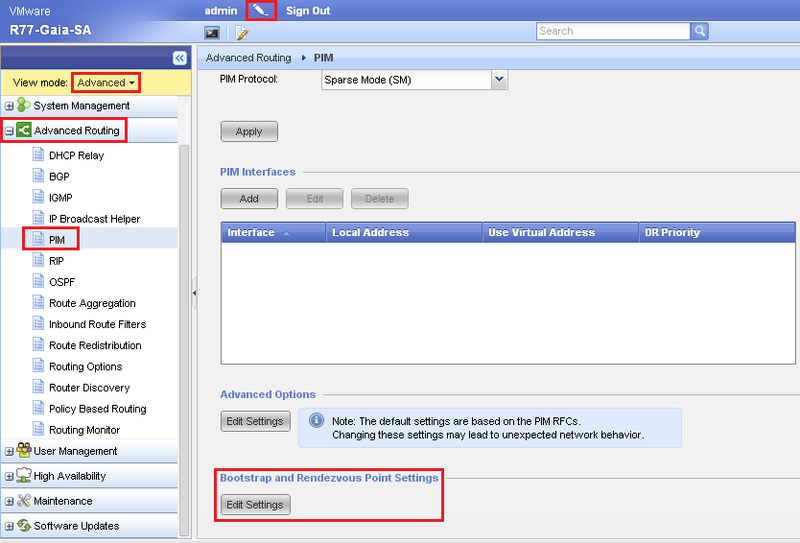 Optional: Enter the Virtual IP address of the PIM interface in the 'Local Address' field. 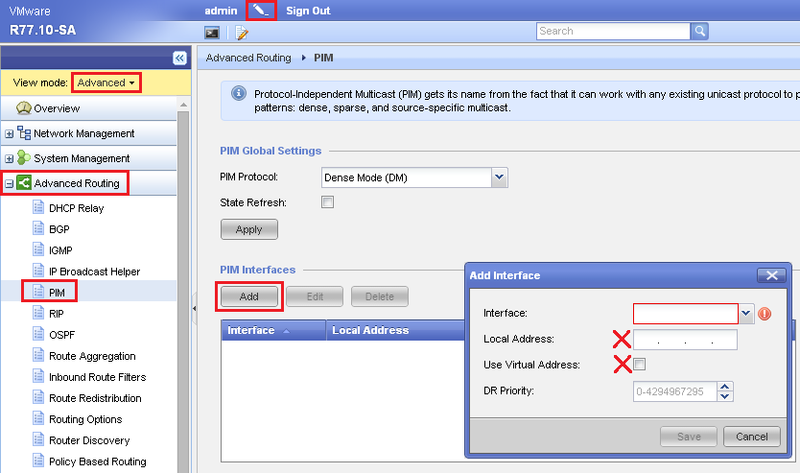 Optional: Enter the Virtual IP address of one of the PIM interfaces in the 'Local Address' field. 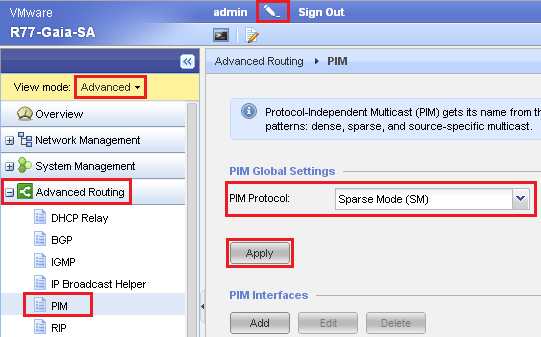 Configure PIM Source-Specific Multicast (SSM) Mode and select the relevant interfaces. Note: In SSM mode, the group range 232.0.0.0/8 is reserved for SSM. No Rendezvous Point is required for this group range, while all other groups require a Rendezvous Point and are treated as normal Sparse-Mode. Set IGMP protocol version to 3 on all PIM interfaces. 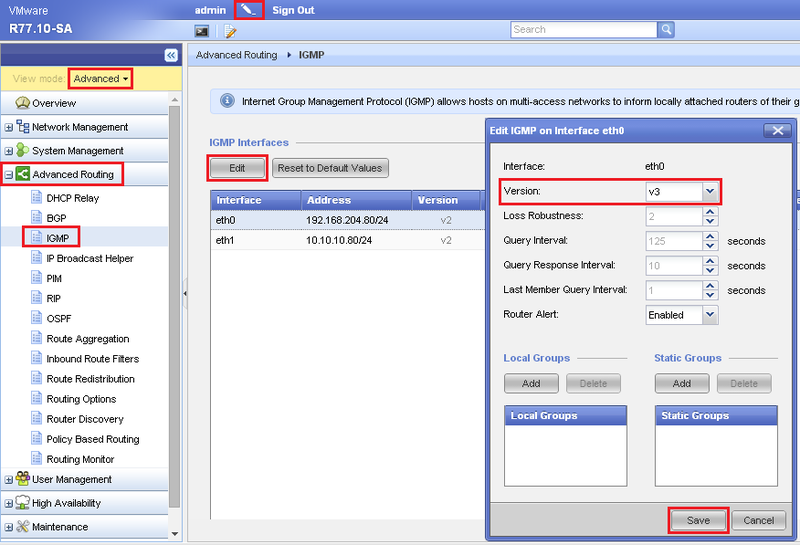 IGMP version on interfaces can be configured either in Gaia Portal, or in Clish. Connect to Gaia Portal with web browser at https://Gaia_IP_Address. Select the interface(s), on which PIM was enabled - click on 'Edit' button. In the 'Version' field, select 'v3'. Number of interfaces that can actually run PIM is limited. While PIM can currently be configured on any number of interfaces in Gaia OS, there is a built-in kernel limitation on the number of interfaces that can actually run PIM. Due to the Linux kernel variable MAXVIFS (defined as 32 in include/linux/mroute.h), PIM will run on no more than 31 interfaces at a time (one interface is reserved as a PIM register interface). On VSX Gateway / VSX Cluster Member, this limit applies per Virtual System. Output of the Clish command show pim interfaces will exclude any interfaces, on which PIM is not running. First of all, make sure that underlying routing protocols are working properly and routing tables on all PIM routers contain correct information. Verify that multicast routing is enabled on all involved multicast routers and involved Security Gateways. In ClusterXL and VRRP Cluster, verify that all routing configuration including PIM is identical on all cluster members. Verify that all PIM neighborships are established on all involved multicast routers and involved Security Gateways. Verify that data packets are arriving with TTL>1, if they need to be forwarded to other interface(s). eth1           Up       DR       sparse    10.110.0.59      1          1      ? eth2           Up       NotDR    sparse    10.13.0.52       1          1      ? Note: If an entry expires, the corresponding entry will be removed from the table. Let multicast receiver join the group 225.1.1.1 and start multicast traffic from Source. Verify that multicast traffic is forwarded to the correct interfaces. The (S,G) and (*,G) state entries from the flags. The incoming interface(s) is(are) correct. Otherwise, check the unicast routing table. The outgoing interface(s) is(are) correct. Otherwise, check the state in the downstream router. Capture the incoming traffic on Security Gateway using the 'tcpdump' command. Capture the data packets with a packet sniffing tool like Wireshark on a neighboring device. SAM acceleration is supported only on 21000 Appliances. SAM card accelerates multicast traffic only if all multicast-enabled ports are running in SAM mode. SAM acceleration is not supported if any one of the multicast interfaces is running in non-SAM mode. One or more Network Processors (NPs) may process multicast traffic. In the example below, we can see that NP2 is processing and accelerating the multicast packets. Capture the traffic on incoming interface on Security Gateway using the 'tcpdump' command. Follow sk92598 - How to debug PIM and Multicast on Gaia.